Is anyone using a jack pyke roe sack? No sorry, I use a harkila one, great for the job. bought a roe sack about ten years ago and used it once. to me they are just not very practical. where i stalk i have to drag for quite a distance so melb s deer drag has been the only thing i ever carry other than knife now. had 5 last weekend and the drag was certainly best option for extraction to the truck. That looks like quality kit far better to buy once. Do you have to carry the deer in the bag? I don't like the idea of ticks and blood near me and they are very heavy for any distance. I am using a rope that I make a shoulder drag out of it's simple, quick and comfortable but I would like to develop a canvas skid to put under the animal to reduce contamination risk. It also doubles as a hoist and I can manage two if it's not uphill. Mine is just a cheapo. Looks like a diamond shaped tarpaulin folded in half. Laces together and has shoulder straps on one side. Just rolls up and goes into your pocket or day sack. If I have far to travel and have been luck then I just strap the beast in and drag it anyway. Bag slides more easily than the carcass. If it tears up, and it will with use, then only £40 to replace. 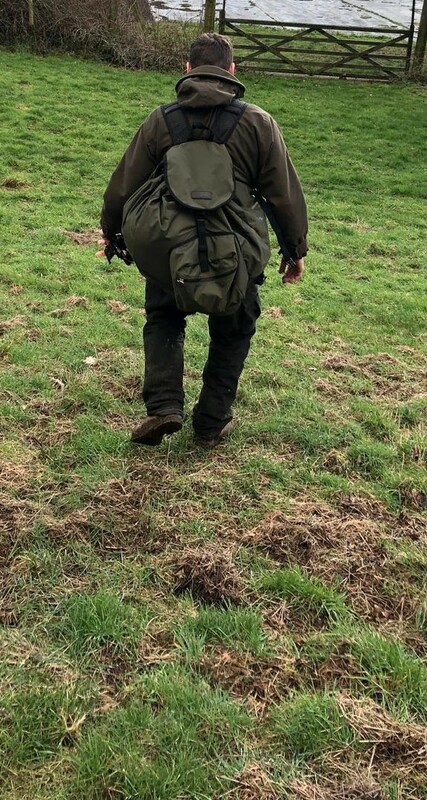 Yeah after dressing in field remove legs and head, that bag will take two easily, below is this afternoons stalk, went out and was back in time for the rugby. Blimey still a lot of snow your way. I just don't want to have to carry the things.. Too heavy for me and it's another thing to clean. Now I find myself doing everything to get the kit to a bare minimum but I am going to look at getting something like Grandalf mentions above as it should slide easier and reduce risk. I'd have thought that ticks and blood would be just as close as when you gralloch. I don't usually have all that far to carry, butif the weather is sopping wet, then I do!